It's even described by E! Online like this: "looks absolutely ridiculous—and we're already obsessed"
US network TV Fox has produced a show called 'I Wanna Marry "Harry"'. In timing that is kinda perfect from a PR perspective (for the show) - Harry and his longtime girlfriend Cressida Bonas have reportedly split - 'Harry' is now set to find 'true love' on a reality show. Described by E! 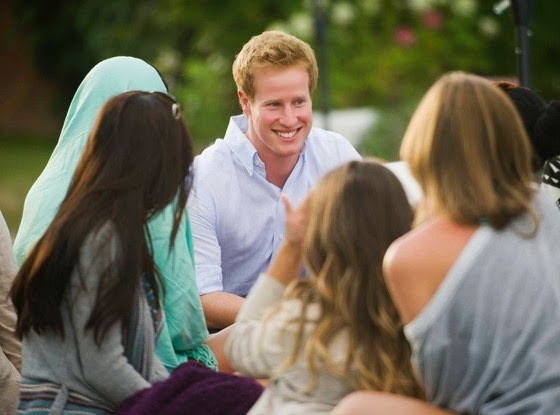 Online as "essentially 'Joe Millionaire', but with a Prince Harry look-alike instead of a fake millionaire. The premise: 12 American girls travel to a gorgeous English country house." "We're at 'Downton Abbey'," one of the contestants shrieks in the first look video below. The assembled women get their first glimpse at "Sir" - that's what they're calling the fake Prince Harry, whose real name is Matt Hicks - when he arrives by helicopter. A masquerade ball follows (of course!) and the 12 contestants meet the "prince" for the first time. I Wanna Marry "Harry" premieres in the US on Tuesday, May 27, at 8pm on Fox. I am currently setting up a petition for Foxtel Australia to screen this gem here (kidding. Not really). Reality meets romance, with a little twist. I Wanna Marry "Harry" premieres Tuesday, May 27 at 8/7c on FOX (in the US). This show now screens in Australia on Channel Ten. To watch all the episodes online, click here. Or tune in every Friday from May 30, at 8.30pm on Channel Ten.